As regular as clockwork (well, a clock that only strikes once a year) it’s time for my review of the new version of iOS – the operating system that powers iPhones and iPads. I’ll be looking in particular at the aspects that will be most useful to journalists and especially mobile journalists (“mojos”) who rely on their smartphones for creating content as videos or photos. And regular as clockwork I need to explain why I’m reviewing iOS 11 in such depth when I don’t do anything similar when a new version of Android is released. After all, Android is the most popular smartphone operating system in the world, running on 80-90% of smartphones against the 10-20% that use iOS (other operating systems barely register). Androids aren’t as uniformly updated to their new operating system (OS) in the way iPhones are. So while this review could be immediately useful to the vast majority of owners of iOS devices, any review of the latest version Android might never be similarly useful. Android’s Nougat OS came out in August 2016 and yet a year later, it is only running less than 15% of Android devices; more people are still using Kitkat from 2013. In contrast, Apple released iOS 10 in September 2016, a month after Nougat, yet within a week it was on 20% of iOS devices and after a month, 54%. Now, as we’re on the cusp of its replacement, it’s on 90% or so. There’s also the small matter that iOS is the platform of choice of most major broadcasters, including the BBC, and many journalists, even if an increasing number are using Android - or, in the case of one high-profile iOS mobile journalist, making a strong case for Android. iOS 11 has been available to developers and anyone willing to join the beta programme since June 2017. Features have been added, removed and tweaked as the beta has gone through numerous iterations. There may be more to come too as my review is not based on the ‘gold master’ - the last beta before iOS 11 gets publicly released – as the gold master isn’t yet out. Nevertheless, after using it for several months, enough is clear for me to write this review aimed primarily at journalists. I’ve been running iOS 11 on my iPhone and occasionally on an iPad Pro to find significant changes. There are already numerous reviews already online. Try here or here for comments on changes to Siri, the fact there are now indoor maps of airports and the new one-handed keyboard option. But I’ve had to draw the line somewhere in reviewing it from a journalist’s perspective. Furthermore, iOS 11 will only really come into its own once developers have updated their apps to take advantage of the new possibilities. - Connectivity: you need good wifi or mobile data speeds to file material quickly. - Battery: you need plenty of juice to record your material. - Capacity: you need space on your device to record the material as videos get very large very quickly. It’s on that last point that iOS 11 brings a welcome innovation: a new format for recording video and taking photos which gives the same quality but takes up less space. Photos don’t have to be .jpg but instead can be HEIF (High Efficiency Image File). And there’s an option to move videos from .mov to HEVC (High Efficiency Video Coding or H.265). With both these formats, recorded material uses up to 50% less space with no discernible drop in quality. 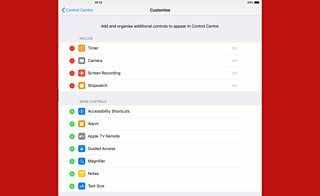 They’ll only be available on newer iPhones and iPads, and even on those, users can choose to opt out of this mode and select instead Most Compatible if they want to continue to use .mov and .jpg files. There are other options to help with storage. 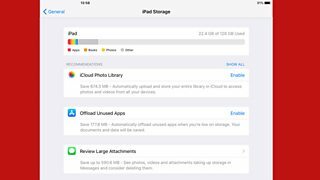 Go to Settings – General - iPhone Storage and your device will check your storage and offer space-saving suggestions, such as Enable iCloud photo library - an option that only the cynical would suggest is a way to enrich Apple even further as you need to pay to store more than 5gb of data. Other options include Empty recently deleted album and Review large message attachments. It’s all usefully pro-active, but not without drawbacks. For example, there’s no obvious way to stop being offered a suggestion: no matter how many times you’ve decided you don’t want to use iCloud, you’ll still get the suggestion. Every. Single. Time. Users can also now offload apps to gain extra space temporarily. Currently, one of the best ways to free up capacity is to delete an app - but doing that deletes all the information within that app too: when it gets reinstalled, it does so as an empty ‘shell’ with no user data inside. Now you can choose to remove the app but when you redownload it, the app is fully restored with all the documents and data you had before. I tried this with a few apps and it worked well. Usefully, apps that I was logged into at the time came back still logged in, which wouldn’t have happened if I deleted the app fully. 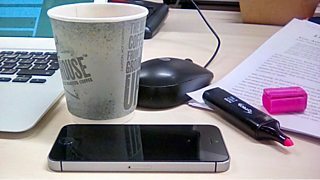 This could be a handy way for a mobile journalist to add storage at short notice in order to record more video. But remember this feature only deletes the app and not the data or documents inside it so if a relatively small filming app is bloated with video content, you’ll only get back the size of the app itself. In that case, deleting the app - once you're sure you've transferred the clips - and reinstalling it fully remains the best approach. And don’t offload an app you’re likely to need, as when it’s offloaded it is no longer available even though it is still visible on your screen (with a small icon to indicate it’s in the cloud). This whole process can be done automatically by switching on an option in iTunes and App Store in Settings. Any apps deemed “unused” will be offloaded without you choosing to do it. However, I’ve yet to establish what counts as “unused”. It would be highly problematic if a journalist went to use an app, only to find that that it was unavailable because their device had unilaterally decided to offload it. The joys of artificial intelligence! Back to the camera and there are innovations both during and after taking a picture. There are a couple of new options for filters on photos (although I should warn that journalists should always be wary of using any kind of filter on a photo unless there’s a clear editorial reason). If you have grown to know and love a certain filter, they’ve been renamed so Transfer is now Vivid Warm, for example, and how they’re displayed is different. Gone is the three by three grid of filters; they’re now displayed in a vertical carousel to the side of the screen. If your device can take Live Photos (a second and a half of video, before and after pressing the shutter button) there’s now much more you can do with them. I have had people on my training course unaware that they were taking Live Photos and then complaining there was nothing they could do with them once they had. Live Photos can be shared easily with other iOS users but are near-impossible to use on social media. Third party apps stepped into the breach, turning Live Photos into GIFs, videos or back to ordinary stills. Now a Live Photo in iOS 11 can be trimmed removing any instability from the start or end. Swiping up on a Live Photo reveals three more options. The first loops it, so the video plays again and again; or it can be Bounced, so it plays and then reverses, like Instagram’s Boomerang app; or – if it is of the right kind of content – it can get a Long Exposure effect. For example, a Live Photo of a waterfall could show just the water cascading down with the scenery around it frozen. Usefully for mobile journalists, these three new effects convert Live Photos into video files, making them easier to share on social media. The trio offers interesting storytelling and creative possibilities, especially for visual platforms like Instagram. However, there’s no way to convert a 'standard' Live Photo into a video for sharing on social: it can only be converted to that format with Loop or Bounce. Developers of third party apps which can do this will be breathing a sigh of relief as there should still be demand for their apps. For those with an iPhone 7Plus, Portrait Mode, where images get a real sense of depth thanks to the dual lenses, gets new options like HDR, filters, and the ability to use a flash. When taking a photo, it’s long been possible to add the on-screen ‘rule of thirds’ guide to aid composition. That grid can now be activated when recording video too. This will be helpful when lining up a shot or trying to keep horizons level. 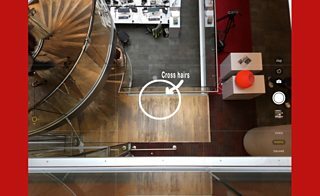 The stills camera also gains a levelling feature that shows when an iPhone is being held perfectly level for an overhead shot. A pair of cross hairs is visible on screen – one fixed, one floating; you’re dead above when the two sets of cross hairs are superimposed. This could have practical applications, for example, when photographing a document, but it’s also likely to be heavily used for photos of food on Instagram. It’s a pity that this feature isn’t also available when holding the phone forwards too, to take photos or videos of what’s in front of you. Had that option been included, it would have been a productive addition to the standard iOS camera. Again, it’s another example of where third party apps will still be needed as many can do this. There’s also now a document scanner built into the camera, within the Notes app; scanned documents can then be annotated and saved as a PDF. The way a screenshot (aka “a screengrab”) is captured remains the same but there’s more that can be done with one. Each new screenshot is shown after capture at the bottom left of the screen. Swipe left to dismiss it (it’ll be saved to the Camera Roll already) or tap and hold to share with another app, or tap briefly once to adjust it immediately. Choose to do nothing and after a few seconds the screenshot will slide away to the left and disappear from the screen, already saved to the Camera Roll. Previously, it took eight taps to access the options to edit a screengrab; now they're accessible straight away. And there are more editing options than before. That’s because the Mark Up tool has had a new lick of paint, although not with orange or purple as those two colours have been removed from the colour-picker. There is though now a choice of pen styles for ‘writing’ on the screen as well as a way to select squares, arrows or circles to add to the screen. This was possible in iOS 10 but you had to draw a square by hand and hope your device recognised the shape and suggested a uniform square. As mentioned above, some innovations will only come with the forthcoming (or recently released, depending on when you’re reading this) iPhone 8 or whatever it’s called. It’s rumoured that the video camera will finally be able to pause while recording – another feature long available in third party apps. The front camera may be upgraded to record in 4K, which is much better for recording a piece to camera; but be aware that 4K video rapidly reduces both battery and storage. From everything I’ve read online, there’s no indication that one long-standing complaint of mobile journalists based outside North America has been addressed. The native iOS camera looks set to continue to record only in 30 frames per second (fps) or multiples of that. This is great if your footage is to be broadcast in North America but not for those of us in many other places which use 25 fps. The crowd-sourced campaign to flood Apple with requests for a 25 fps option seems to have fallen on deaf ears. Again. Whenever a new version of iOS comes out with new features, there are always cries from Android users that their devices “have had [insert name of feature] for years”. This next change in iOS 11 is another one of those: the ability to record the screen. Swipe up to access the Record Screen icon in the revamped Control Centre (more on this later) and tap it. After a short countdown, it starts and you can navigate around your device, recording all the while. Make a long press to see the option to record with the inbuilt mic running, to add commentary or guidance. Even my crusty old iPhone 5s recorded video with audio from YouTube and BBC iPlayer with no difficulty. This feature could pose huge challenges around copyright both for the big players as well as for individuals posting to Snapchat and Instagram Stories. Currently, you get a notification when someone screenshots your latest masterpiece on those two platforms. In future, ephemeral media will be nothing of the sort – and you’ll have no idea your friends, followers and foes have saved your content. It remains to be seen whether media companies and app developers will respond by adding code that prevents screen recording. There are practical applications for mobile journalists too. Gone will be the annoyance caused when an app lets you make content but will only post it to its own platform, with no way to download your work to your Camera Roll for sharing elsewhere. In iOS 11, you can simply record the screen to get a version you can use. Similarly, there’ll now be a much simpler and more visual way to show what someone’s doing on an iOS device (in a news report for example) without their fingers being in the way. On a purely personal level, it’s going to make training a lot easier if I can record my screen to demonstrate how to do something. Screen recording is accessible from the Control Centre which itself sees a huge transformation, with customisation now possible of a wider range of features. You can now show only the widgets you use and remove those you don’t. Low Power Mode can be added into Control Centre, rather than digging several layers deep to activate the option to save precious power. For mobile journalists needing to make an audio recording in a hurry, you can also pop a shortcut to Voice Memos here as well. (It’s worth noting at this point that the stock Voice Memos app itself has – again – had no discernible changes.) Some options are only revealed after a long press: for example, press and hold on the symbols for wifi, airplane mode, or Bluetooth to open up another panel which is where AirDrop now lives, along with the option to toggle personal hotspot on and off. Press and hold on the screen brightness option to reveal Night Shift which turns a blue-hued screen into one with an orange glow. Hold on to your hats. Here’s something else that Android users have had for a while: a device-wide file structure. It’s long been the cause of some criticism that content created in an app on iOS is only saved to that particular app. There was no central ‘home’ where all files could be seen. Finally, in iOS 11 there’s the imaginatively named Files app. Create a document in an app that supports the new system and it can be saved to Files which itself can access - connectivity permitting - cloud services like iCloud, Dropbox and Box. Documents can be made into Favourites and they can be tagged, searched and sorted. You can have sub-folders too and documents can be dragged and dropped into other apps. The workflow differs between the iPhone and the iPad because of their different screen sizes; but Files should be a big help to journalists wanting to move documents around their devices more easily. It will be especially useful to those who already use a lot Apple apps like Keynote and Pages, as well as to Mac owners since Files echoes Finder on a Mac. Thankfully, most journalists will never encounter any real danger doing their jobs but some do and for them, one new feature in iOS 11 could be welcome: the ability to lock the device quickly and prevent it from being easily re-opened. Depending on the laws of the country where you work, police officers and others can demand you unlock your device with your fingerprint but they can’t demand you hand over your passcode. Press the on/off button five times and Apple’s Touch ID system is disabled. It can only be re-enabled with a passcode which you could decline to give. Until now, disabling Touch ID was time-consuming, for example by not using an iPhone for several days or restarting the device. This new option looks to be a far better and quicker way of preventing someone gaining unwarranted access to your material. This quintuple press function can also do a few other things that journalists and others could find useful in certain circumstances. Despite locking the device, the screen remains active and can show a slider which opens up your medical ID. That could allow paramedics or anyone else to see potentially life-saving information - as long as you’ve previously entered it in the Health app - such as your blood group or other medical notes. Five presses can also result in a call being made to the emergency services, while also alerting colleagues or family members to this. 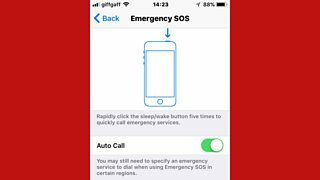 Buried in Settings - Emergency SOS is a toggle to turn on Auto-call. As long as you have connectivity, pressing the on/off button five times will call the your local emergency number (999 or whatever) and at the same time send a text message to anyone you’ve previously specified in Settings to say that you’ve contacted the emergency services. They’ll also get a link to a map showing your location. One word of warning: this function includes an option to cause a loud, high-pitched alarm to be emitted while it makes the emergency call: this could alert others to where you are, which may not be welcome. For the busy journalist there’s a new automatic call answering feature buried in General - Accessibility - Call Audio Routing - Auto-Answer Calls. Once turned on the feature will answer phone calls after a few rings - you can choose how many - so you don’t need to physically touch your phone to answer it. This could be useful but remember it will answer all your calls, whether from contacts you need to speak to, the boss you’re trying to avoid or those annoying “have you had an accident that wasn’t your fault?” calls. Auto-answering could be handy while driving but using a smartphone while driving can have fatal consequences. This is addressed with a new feature found within Do Not Disturb in Settings. Do Not Disturb While Driving blocks calls, texts and other notifications once it detects you’re driving (which is done via the device’s accelerometer). But if you set it up to be active automatically, you need to be careful in case it starts working when you’re on the bus or in a taxi. Yes, you’re moving but not in a way that using your device should be problematic. And even if you are in a car and driving, calls can still get through if the iPhone is connected via Bluetooth to a hands-free kit. If the developer of your favourite 32-bit app has chosen not to upgrade it for any reason, then that’s just hard luck. It can’t be used in iOS 11. So it makes sense to save anything important from those apps before upgrading and then to search for another with similar functionality. It’ll be too late to rescue content from the old app once you’re on iOS 11. It might not be obvious how changes to Safari, the iOS web browser, could have major implications for mobile journalists – so much so that I had to have a real technical expert flag it up to me. But once it was pointed out that Safari in iOS 11 will support webRTC, the penny dropped. WebRTC is Web Real Time Communication, the technology that lets applications such as video conferencing, file transfer, chats or desktop sharing take place without needing software or plug-ins. In practical terms, webRTC as part of Safari, should in time make possible in-browser video streaming by journalists, rather than requiring separate apps such as Skype. The integration of webRTC will also benefit newsroom producers: if a guest is wanted in video or audio ‘in quality’, they won’t need to download an app; instead, the producer could send them a link in an email to click and that should let them open up a direct stream. The same limitations of poor connectivity, bad lighting and battery life will still apply of course. It’s another area where some Android users will be able to roll their eyes wearily, sighing that their device can already do this. I’ve saved until last one aspect which could be genuinely transformative for journalists, app developers and anyone using an iOS device. AR Kit is Apple’s foray into Augmented Reality (AR), adding virtual objects into images of the real world via the device screen. This is different from virtual reality which is a totally artificial, computer-generated simulation. AR enhances what already exists with digital components that should add value. Think Pokemon Go - but with something useful rather than a game that involves running around after imaginary creatures. 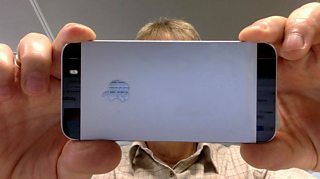 The iPhone camera will map objects onto the world it can ‘see’ for the user to view on the screen. A simple example would be an app to show how different layouts of furniture would look in a room, saving the effort of physically moving the sofa and chairs each time. AR Kit gives developers the tools to build AR experiences in iOS 11, and once it’s fully available there’ll be a whole slew of new apps to ‘show’ virtual objects in the real world. Perhaps in the near future you’ll be able to point your device towards a building such as Buckingham Palace and see information about it on your screen, or news reports about monarchs who’ve lived there. Watch this space. All in all, then, iOS 11 is a pretty hefty update. One final word: while Apple do make it possible for anyone, anywhere in the world to download the update to a compatible device as soon as it's available, it's often quite a scramble to get connected to their servers to download it. Despite extensive testing by developers and those on the beta of iOS11, new bugs often turn up once tens of millions of users have got their hands on it. You might do well to wait a few weeks to see if Apple issue a fix to those bugs, in the form of iOS 11.1 - which I won't be reviewing, sorry. The BBC Academy Blog discusses current technical, ethical, production and craft issues in the media industry.